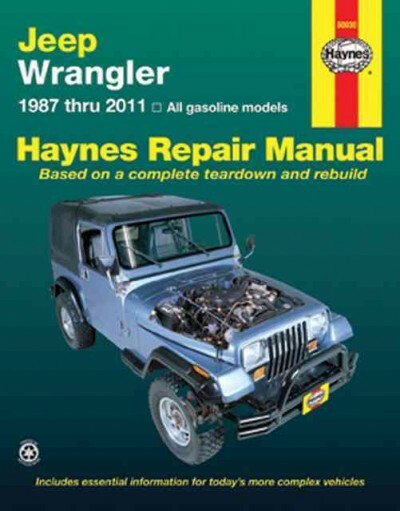 Jeep Wrangler 1987 - 2011 Haynes Owners Service & Repair Manual covers: All models. The Jeep Wrangler may be a compact four-wheel drive sport utility vehicle vehicle (SUV) and an off-road vehicle manufactured by American automaker Chrysler, under its Jeep marque - and from now on in its fourth generation. It is just a successor all the way to famous World War 2 'Jeep' vehicle signifies the Willys civilian Jeep (CJ) on the inside 1950s, later produced by Kaiser-Jeep and by American Motors (AMC). The Wrangler debuted in 1987, was revised in 1997 and again in 2007. Wranglers continue using live axles both front and back as with their predecessor, the CJ. Each Wrangler model has received a designation provided nameplate Wrangler when it comes to their generation: YJ (1987-1995), TJ (1997-2006), LJ's (2004-2006 Unlimited models) and JK (2007-present). Military versions that belong to the Wrangler have carried the J8 designation. YJ models were manufactured between 1987 and 1992 at AMC Brampton Assembly Plant, and subsequently while at the Toledo South Assembly Plant plant. In 2006, Wrangler production was moved to Toledo Supplier Park. The Jeep YJ, sold as you move the Wrangler, replaced the much-loved but slower-selling Jeep CJ in 1987 and was built in Brampton, Ontario, Canada, until the plant closed on April 23, 1992. Production was then moved to Toledo, Ohio, employing the same plant that produced the Willys Jeeps the federal government WWII. The American Motors Corporation (AMC) had designed the brand new jeep to get to be more comfortable on-road so as to attract more daily drivers. It was eventually a new design with a wider track, slightly less ground clearance, plus much more comfort. The YJ also had a leaf spring suspension kind of like that of the CJ; however, the springs were wider, and all the YJs sported trackbars and swaybars for improved handling. Regardless of the odd new grill, your whole body may be very much like the CJ7's, and in fact is interchangeable with a few minor modifications. The YJ also was given a larger windshield all over the CJ. The YJs are easily identifiable a result of rectangular headlights, disliked by some Jeep aficionados, in addition to incontrovertible fact that the wiper blades rest on the windshield giving this version a distinctive look. The blades rested on the windshield because now wider arc in the game blades to clean up the more expensive windshield. The two of these changes were later removed when the TJ changes came to exist in 1996. 632,231 YJs were built through model year 1995, although YJs were still produced into mid-1996, bringing the total production number to 685,071 units. The YJ used a 2.5 L AMC 150 I4 or optional 4.2 L AMC 258 I6 until 1991. That year, a fuel-injected 180 hp (134 kW) 4.0 L AMC 242 variant replaced the 112 hp (84 kW) 4.2 L 258 CID straight-6. The NP207 transfer case was used only in 1987 and replaced due to the fact NP231. The roll cage was extended in 1992 to allow for for rear shoulder belts, and anti-lock brakes were added to be found in option take into account year. An automatic transmission option for 4-cylinder Wranglers came in 1994, and then a center high-mounted stop lamp. In 1994, the slave cylinder on manual transmissions was moved outside of the transmission's bellhousing to allow for easier replacement, as well as in 1995 the Dana 30 larger U-joints were used . To get the 1992 model year, the YJ switched over to an electronic speedometer outmoding the cable speedos on older YJs. 1995 had been the only year to get a fully galvanized frame and body. There have been no 1996 model year Jeep Wranglers. YJs produced at the begining of 1996 were sold as 1995 model years, but featured a few new parts not seen on any earlier YJ. This included the new TJ bumpstops located on the hood (rubber boots vs the traditional U-bars), reinforced tailgate hinges, and a bit of even had rear TJ bumpers. Some also got the newly tuned I6 that was which is designed to run quieter in preparation for any of the TJ. Top options for YJ were roughly the same as those offered on TJ. A Soft top with "half doors", featuring soft plastic zipper windows came standard (windows can be considered removed completely from these doors). Full frames doors with conventional glass windows were optional on soft-top models. Hard tops with rear wiper and defroster were optional, but came standard with full framed doors. YJ featured large mirrors with manually adjustable arms on half door models, while full framed doors received smaller adjustable mirrors with fixed arms (which have been mounted further off the door corner, when compared to larger style mirrors). As outlined by year and interior color, Jeeps is in many cases had as part of your top colors in black, white, tan and gray. Roll bar padding normally matched top color, except for white tops. The YJ gave way to the TJ used for the 1997 model year (note that there was no 1996 model year; the 1997 TJ was released in Spring 1996). This updated Wrangler featured a coil-spring suspension (in keeping with that with all the Jeep Grand Cherokee) for better ride and handling, as well as a get back on the classic CJ's round headlamps. The engine is the identical 4.0 L AMC 242 Straight-6 for Cherokee and Grand Cherokee. A 2.5 L AMC 150 Inline-4 motor was available on entry-level models until 2003 when the 2.4 L DOHC 4-cylinder engine previously officially used on the Chrysler PT Cruiser replaced it. A right hand drive version that belong to the TJ was available for export markets, and seemed to be offered accessible for sale to US rural route postal carriers. The version in order to US postal carriers was only available by using an automatic transmission. More than 10 years ago, the fuel tank became standard at 19 U.S. gallons (72 L; 16 imp gal) capacity. There were some changes that occurred relating to the 2002 and 2003 years that made some parts not easy to directly swap in between the two, but as well as made it easy to identify certain years. From 1997 to 2002, the side door mirrors were black metal framed mirrors; and from 2003 to 2006 we were holding plastic molded mirrors. Accentuate your figure of soft and hard tops is slightly different, and all the fabric and colors available changed from 2002 to 2003. In 2003, the 3-speed automatic transmission was replaced that has a 4-speed automatic with overdrive. It will have the high quality option of turning off overdrive by way of a dash switch if desired. 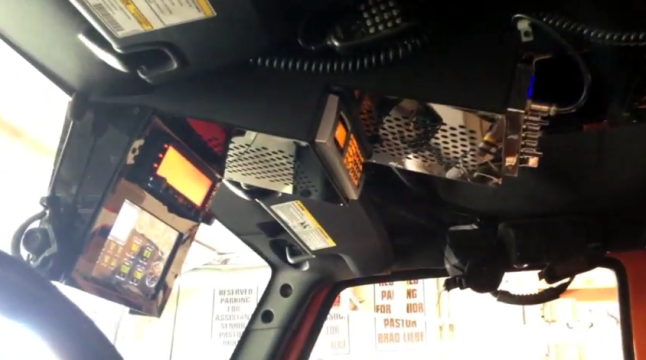 The radio bezels went originating from a rectangle in 2002 on to a rounded edged rectangle in 2003, so swapping these also required the console to either be swapped out or modified. The sound bar inside was changed to sound pods. The interior seats also changed design from 2002 to 2003, going out of a rounder model to at least one with a distinct separation between as well as headrest areas. The product quality skid plate had also been revised for 2003 to create more space for the Rubicon's bigger NV241OR transfer case. The change out of your 30/32RH to qualify for the 42RLE also gained a single more skid plate. This version of the new Wrangler is also notable that they are was the last production vehicle in order to AMC-related parts. The AMC Straight-4 engine was retired as soon as 2002 model year, and both the AMC Straight-6 engine and all of the door handles (the latter of which first appeared on AMC vehicles from inside the late 1960s) were retired and with this generation in 2006. For example the YJ Wrangler, the TJ Wrangler used both the AMC passenger car door handles and also the larger door handles off the AMC-built Jeep CJ for higher-end models.